Destiny Xur update: should you buy Plan C? One of the most famous fusion rifles is on sale this weekend in Destiny. Is it worth your Coins? Plan C can be yours this week for 17 Strange Coins You only need to find Xur. 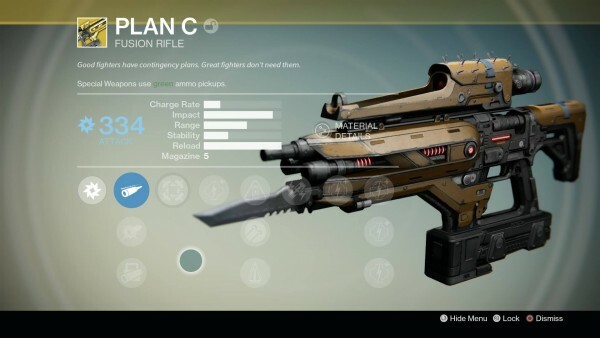 Given the state of fusion rifles in Destiny these days, is it worthy of your Exotic slot? We’ve asked our Destiny expert Alex to help us out, and the answer is not a simple yes or no. One other interesting bit is that Plan C can take out the Devil Walker in the Shadow Thief strike with only 3 shots, provided Arc burn is active. There you have it, folks. It’s one of the best fusion rifles, but do you use fusion rifles? This article was originally published in July.